I'm a busy mom of two that invented a new product called Roundabouts® Cupcake Sleeves and began selling online in Feb 2009. 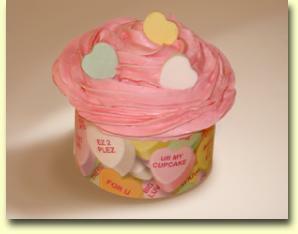 They're wraps for cupcakes that transform standard cupcakes into virtually anything. Using toppings easily found at a grocery or local party supply store, our decorative self-adhesive cupcake wrappers instantly transform cupcakes into popcorn tubs, gumball machine, sushi, and ice cream cones. Our wraps are resistant to grease an oily substance, are earth friendly, and wipe clean if things get a bit messy in the kitchen! We’ve even had customers wash and re-use them, adhering a second time with a dab of frosting. We have 70+ Designs/Themes to choose from. We personalize, customize and have not only been featured on Rachel Ray Magazine, we are proud winners of the Most Innovative Exhibitor Award at the 2010 July CA Gift Show in Los Angeles. These are awesome!! Very easy to put on and makes the cupcake oh so pretty :) I wanted to post a pic of my cupcakes but unfortunately I couldn't find my camera.